Deduction 2! Letters to the Strand. Add your friend's details to the box below and a new account will be created for them with a free ticket to Deduction 2! 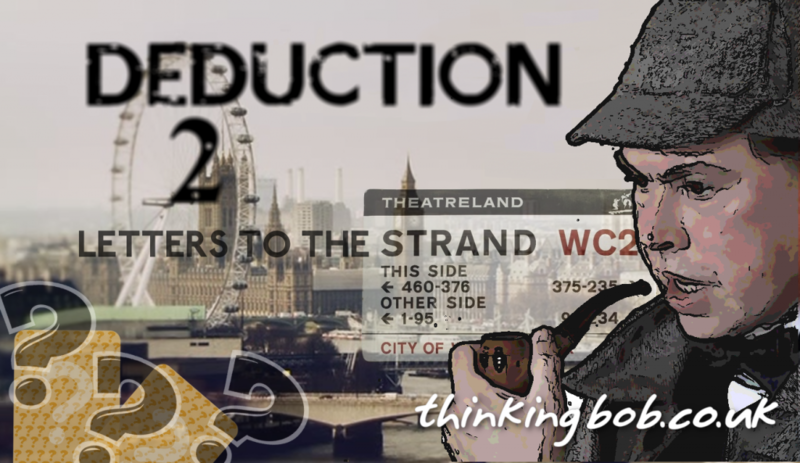 Letters to the Strand..
Sherlock is back in our new Treasure Hunt Event - This time we're playing guess who! Whether you've already played our Marylebone Deduction game or not, you will enjoy our brand new mystery treasure hunt set in London's Westminster. Follow clues, make deductions and solve the mystery. Follow the clues and deduce who’s the target..
At thinking bob we love our Treasure Hunts and we love mixing Sherlock Holmes with our favourite board games – shaking them through the brains of our writers and game creators to produce epic experiences on city streets – this summer we’re inspired by Guess Who. Whether you’ve already played our Cluedo inspired Deduction game or not, you will enjoy our brand new mystery Treasure Hunt set in London’s Westminster.